PICTURED: Camera footage of one of the several foreign objects present on the field throughout the first test. 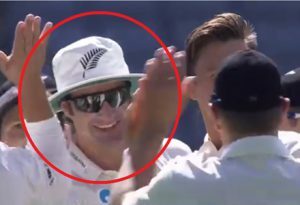 The Black Caps’ famous test win over England in Auckland has been marred today, by accusations that skipper Kane Williamson introduced a series of foreign objects to the field in order to tamper with the score. Cameras at Eden Park caught what appeared to be four distinct objects being used to bat, bowl, field, and otherwise change the score in a variety of ways, seemingly right under the nose of the captain. Those objects included South African-born Neil Wagner, South African-born BJ Watling, Indian-born Jeet Raval, and Zimbabwean-born Colin The Big Homes*. At a hastily arranged press conference today, Williamson acknowledged the presence of the objects, and admitted to being aware of their use. “What kind of things?” he was asked. “Oh, uhh, various things,” he nodded, sullenly. “The decision was made in the dressing room, uh, prior to the uh, match, that we would use four foreign objects in order to attempt to gain an advantage in the game. But both privately and publicly, a rift is emerging within the team, with other New Zealand players saying they had “no idea” about the tactic. Swing bowler Tim Southee said he was “completely blindsided” by the revelation that any of the four foreign-born players were on the field, saying he hadn’t noticed them at any point. Coach Mike Hesson also denies involvement. On the back of growing public anger, New Zealand Cricket is investigating the incident, not ruling out punishing Kane Williamson by never allowing him to shave again. The scandal comes in the wake of accusations from earlier in the test that England brought sandpaper onto the field in order to sand down Craig Overton’s head into something more aerodynamic. *English translations provided by Google.